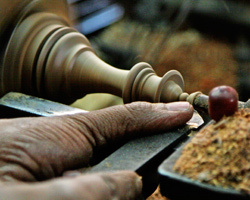 The Knight, or horse, is usually the most time consuming of chess pieces to make. It’s usually made using a turned base and a separate carved top. These two pieces are then mated together. 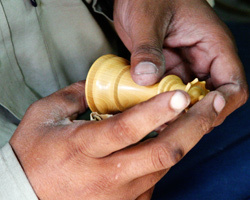 The complexity of the knight is often the biggest factor in the cost of a chess set, in some cases it can take an expert knight carver up to four days to carve four knights, although this would normally only apply to extremely luxury sets. Ebony is one of the most popular woods used to make chessmen. It is extremely dense and heavy. A chunk of ebony can feel like a chunk of metal in the hand. It’s a rare wood and is increasing in value all the time. It’s downside however is that it is prone to cracking. It’s very common to see antique chess pieces with cracks in the ebony pieces. This is just one characteristic of ebony wood that we can’t do anything about. Thankfully most chess manufacturers and retailers offer a free replacement service for cracked pieces.